Abstract: This article contextualizes the history of the so-called Caesarean section to argue that the history of obstetrics is written at the intersection of manifold cultural phenomena. The article presents a unique historical document, a notarized act of 1473 drawn up for a Provençal barber surgeon commissioned to extract a fetus from a corpse. 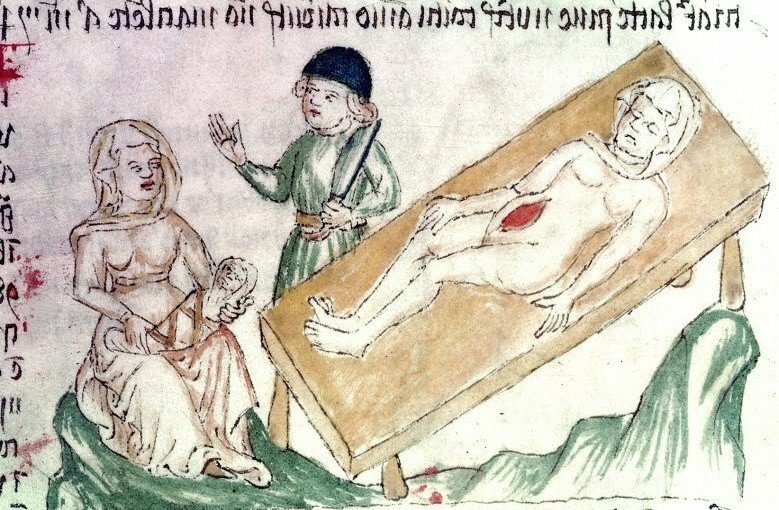 The procedure it prescribes was technically a postmortem dissection, or sectio in mortua, a process linked to surgery and theology as much as to law, superstition, and inheritance. In addition to its analysis, the article presents a comprehensive critical historiography, a transcription and edition of its primary source, a table of other extant primary sources that reference sectiones in mortua, and a detailed bibliography. Introduction: One sunny spring day, a Resurrectionist priest sips tea and speaks of his time as a Bolivian missionary in the 1960s and ’70s. His recollection of the local ‘Indians’ is obscured by more than three decades’ distance. China cup in hand, he recalls vaguely their mud huts, flocks of sheep, herds of llamas, and the beautiful, rugged terrain of the altiplano. With greater precision, he speaks about the local belief system, especially attitudes towards stillbirths. This left a strong impression upon him. The priest emphasizes how deeply fearful the locals were of stillborn babies, and he flavours his recollections with two sad anecdotes. One day, he says, some villagers brought him a small blue corpse. The baby’s father insisted that the missionary baptize it. Since this was canonically impossible, the priest performed an impromptu blessing. It effectively banished the evil spirit conjured by the unfortunate birth. Satisfied with the blessing, the villagers relaxed and returned to their normal lives. On another occasion, one of the priest’s confrères was less delicate. A mother presented him with her dead baby, pleading for a postmortem baptism. At last the cleric told her, “The Church will only permit me to baptize your child if it draws milk from your breast.” Since this was impossible, the mother went away frustrated and ill at ease, having been unsuccessful in her bid to exorcise the unlucky spirit.